Make people surrender guns in domestic violence cases? In Missouri and Kansas?? 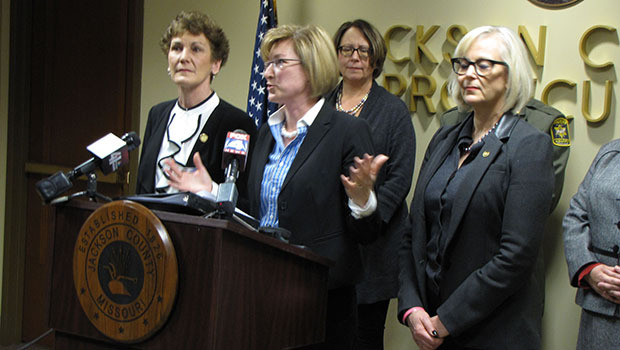 (left to right) Kan. Rep. Barbara Bollier, Jackson County Prosecutor Jean Peters Baker, Mo. Rep. Stacey Newman, County Legislator Crystal Williams (background). One state representative in Missouri and one in Kansas are taking on the gun lobby, a sort of charge of the light brigade that seeks more soldiers. Each has introduced legislation that would allow judges to order people in pending domestic violence cases to temporarily surrender their guns. Mo. Rep. Stacey Newman, a St. Louis area Democrat, and Kan. Rep. Barbara Bollier, a Mission Hills Republican, on Friday asked citizens and advocacy groups for help. Missouri ranks seventh nationwide and Kansas 12th in homicides among females murdered by males. And 98 percent of victims know their killers and the majority of the murders are by gun. Abused women are five times more likely to be killed by their abuser if a gun is available. Intimate partners with guns murdered more than 6,410 women nationwide in the last decade. In December, the two representatives founded a nonpartisan national group called American State Legislators for Gun Violence Prevention (ASLGP.org). Supported by domestic violence opponents and others, it so far includes a total of about 200 state legislators in 50 states. Bills like theirs will be introduced in other states and have become law in a few states in the past. On Friday, Susan Miller of Rose Brooks domestic violence shelter was among the speakers. Abusers – even if they don’t murder with guns – routinely use them to threaten and control their victims, she said. Bollier said she does not know yet if the NRA will come out against the bills but she hopes not. “I believe in my heart the NRA is not a pro gun violence organization,” she said. Still, she said she knows the odds of success among pro-gun Kansas politicians are long.